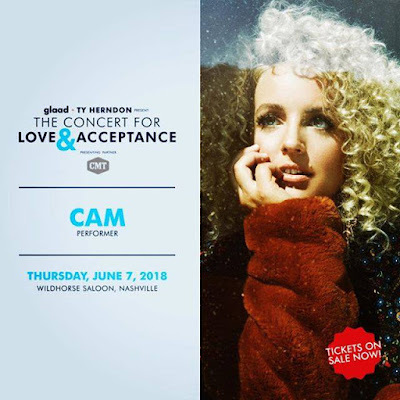 CAM Added to 2018 Ty Herndon Concert for Love and Acceptance! Ty Herndon's annual Concert for Love and Acceptance will be hosted by CMT's Cody Allan on Thursday, June 7, 2018 at 7 PM during CMA Fest week. This annual event is sponsored by GLAAD (Gay & Lesbian Alliance Against Defamation) and will take place at the Wildhorse Saloon. The Concert for Love and Acceptance brings together a coalition of artists and celebrities appearing and performing in support of at-risk youth in the Nashville community. A red carpet event will precede the concert. Lineup currently includes: Brandon Stansell, Calum Scott, Cassadee Pope, Michael Ray, Terri Clark, Ty Herndon, CAM, and Shelly Fairchild.